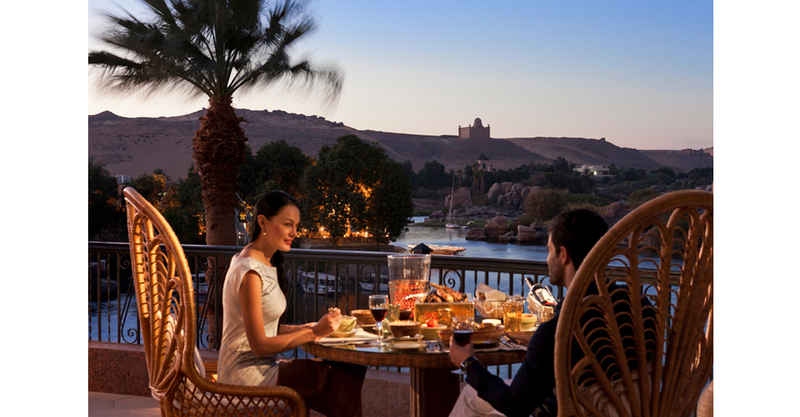 Looking out over the Old Cataract Aswan, majestically set on a hill overlooking the Nile, one would still hear the moving notes of the violin that once played in the elegant rooms, at the rhythm of the hosts footsteps dressed in gala clothes. As if time had stopped flying. It was the romantic era, away of all modern technology, the era of walks on the banks of the Nile contemplating the magnificent sunrises and sunsets. 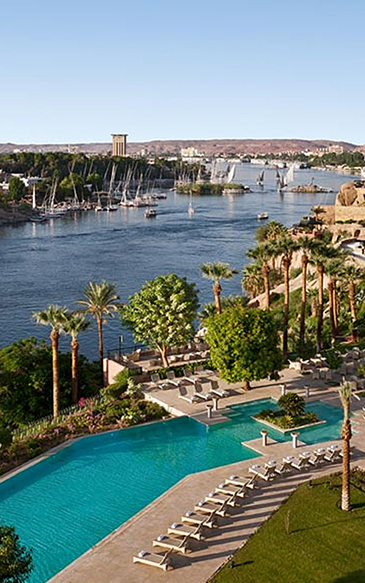 It is this same Nile that inspired the novelist Agatha Christie to unfold certain scenes of her work «Death on the Nile» in the hotel Old Cataract Aswan, a book that later became a great cinematographic work, during which the illustrious hotel was used as setting for the shooting of part of the film. 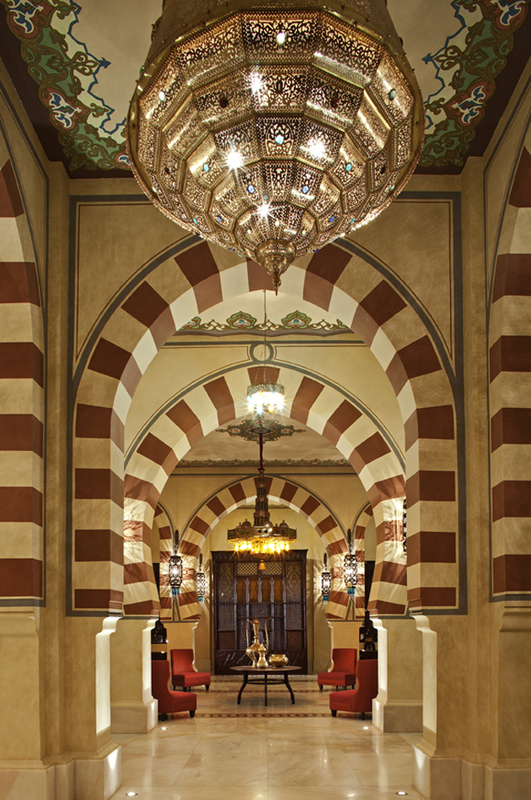 It is in the dining room of this magical place that many scenes of the film taken from Agatha Christie’s book «Death on the Nile» were shot with Peter Ustinov as Hercule Poirot, Bette Davis as Mrs. Van Schuyler, Jane Birkin playing Louise Bourget, to name a few. The film received, in 1979, the Oscar for Best Costume Design by Anthony Powell. An unfinished obelisk was found in Aswan, still welded to the rock that showed the contemporary world the know-how of Ancient Egyptians. Wooden corners were carefully placed in notches of the rock. The block was descended to the river and laid on bricks and silt, the felucca accosted before the recession, was loaded, and waited for the following flood to deliver. Karnak, at the great temple of Amon, a forest of 134 columns. The nave alone has the dimensions of Notre-Dame de Paris. 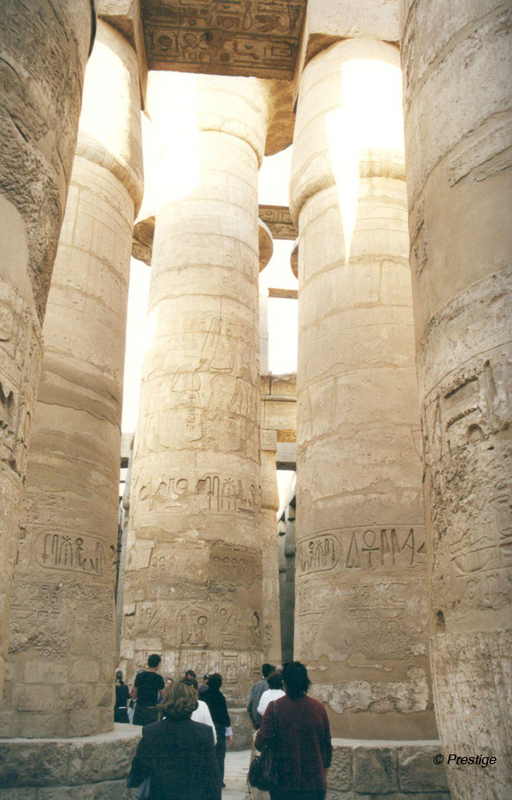 Each pillar in Karnak is connected to the other by a nail made of cedar wood brought back from Phenicia. 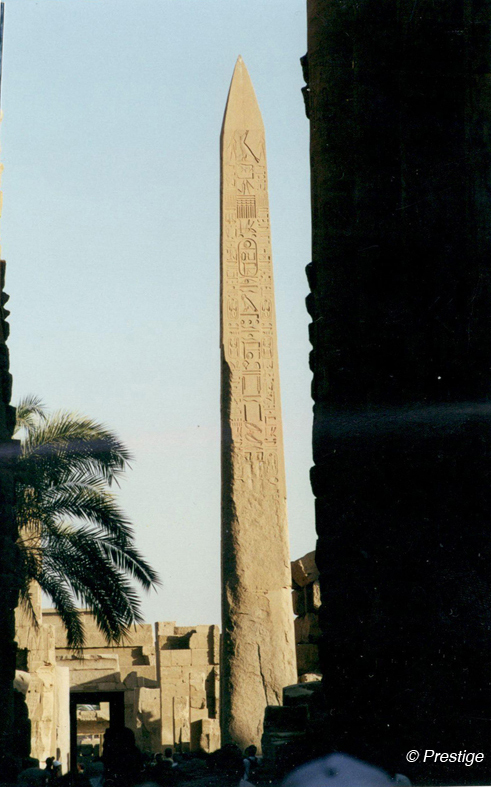 One of the two obelisks of pink granite offered to France by Mohamed Ali in 1831. The other stands at Place de la Concorde in Paris. The top of the obelisks was covered with gold. Their function, capture the divine energy of the solar star. The necropoles were built on the left bank of Thebes, where the sun sets. Those of the royal worship were built at the beginning of the reign of a pharaoh, and the work stopped at his death. If Séthi 1st broke records of longevity, his endless grave witnessing of that, Tutankhamun, who died at the age of 18, was entitled to only one grave of a few rooms, although one of the richest and best preserved of the Valley of the Kings. 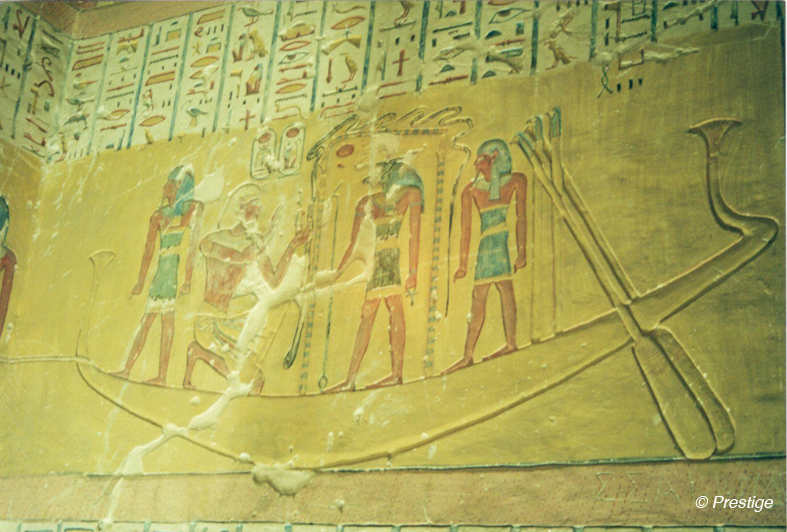 The recurring themes in the tombs of royal worship: the nocturnal journey aboard the solar boat, the beetle: personification of the rising sun, God with ibis head, Thôt who orders the weighing of the heart of the deceased. Osiris, husband of Isis who reigns over the kingdom of the dead while his son Horus reigns over that of the living. 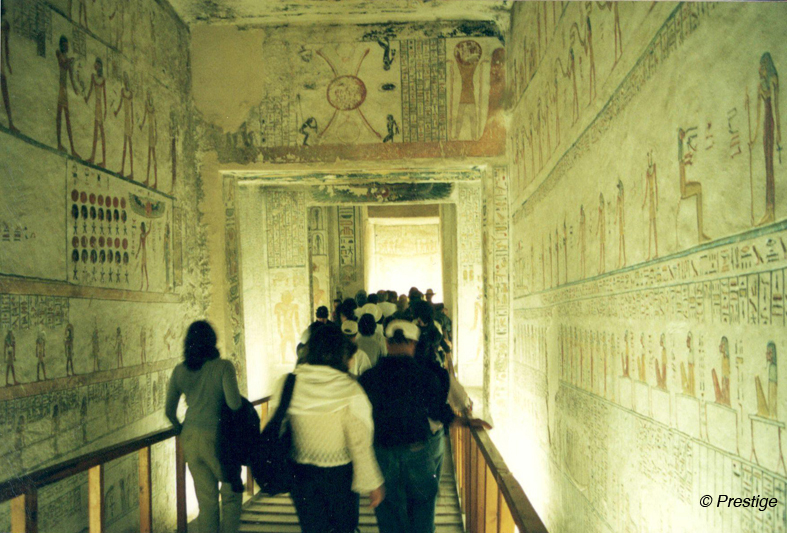 Inside the tombs are frescoes of infinite richness. In most representations, kings wear the pschent, double crown of Upper and Lower Egypt.